Eddie Souza is a recent graduate of the Central Maryland School of Massage (CMSM). He graduated with honors and excelled in Swedish, Deep Tissue, and Sports massage modalities. He is native of Brooklyn, New York and is fluent in English and Portuguese. He holds a Bachelors of Science in Physical Education from Washington Adventist University in Takoma Park, MD. His education focused on courses such as Kinesiology, Biomechanics, and Exercise Science. Eddie tailors his massage sessions specifically to his clients needs. 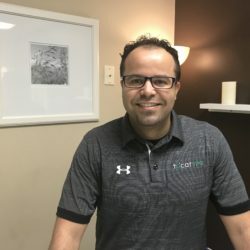 Given his background in Anatomy & Physiology, he is able to help clients minimize pain and reduce tension with a blend of therapy and relaxation. Outside of work Eddie maintains an active lifestyle by playing soccer and hiking on the weekends. He is passionate about working with kids and is a youth soccer coach. Eddie is an active member of the American Massage Therapy Association (AMTA). He looks forward to continuing his massage education with coursework in functional anatomy, active isolated stretching (AIS), prenatal, and infant massage.